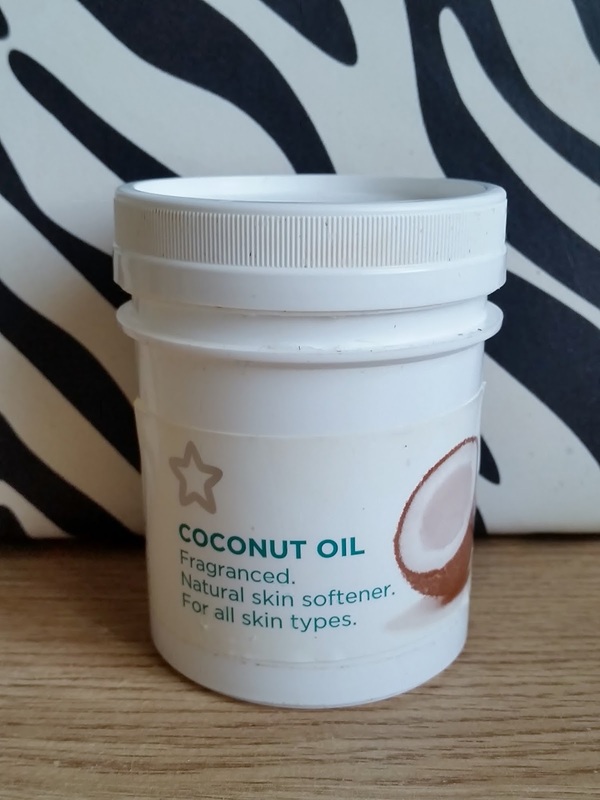 Hearing about coconut oil and all the benefits it can help with, i was on a shopping mission to find one. I managed to find one that is Superdrug's very own. scalp and dry or damaged hair. This natural product is solid at room temperature but will gently melt on contact with your skin. That is true as i scoop my finger in the pot and warm the solid in my fingers before it turns into a liquid. 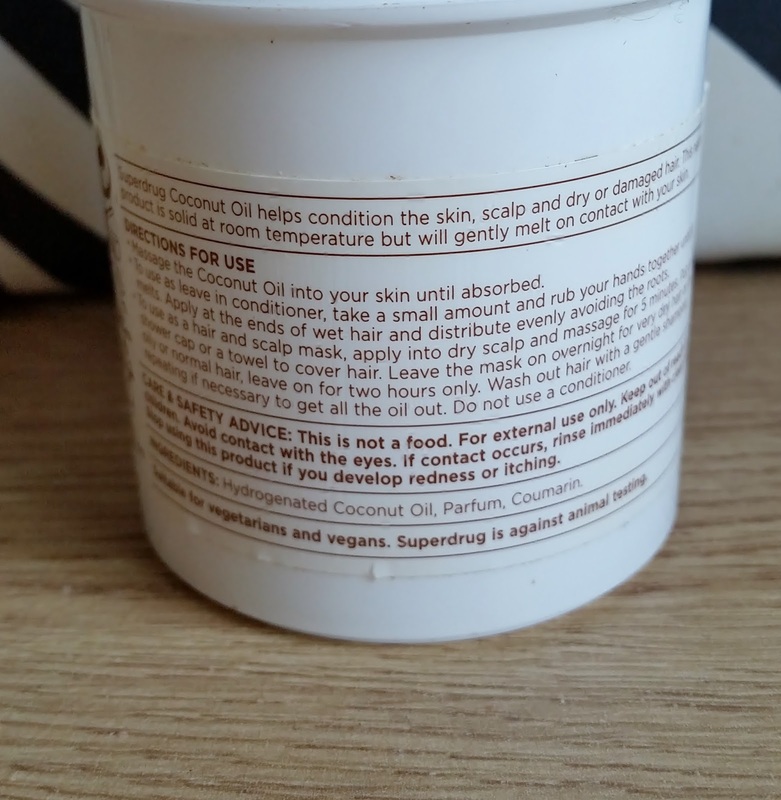 * Massage the coconut oil into your skin until fully absorbed. * To use as a leave in conditioner, take a small amount and rub your hands together until it melts. Apply at the ends of wet hair and distribute evenly avoiding the roots. * To use as a hair or scalp mask, apply into dry scalp and massage for 5 minutes. Put on a shower cap or towel to cover hair. Leave the mask on overnight for very dry hair or for oily or normal hair, leave on for two hours only. Wash out hair with a gentle shampoo, repeating if necessary to get all the oil out. Do not use a conditioner. 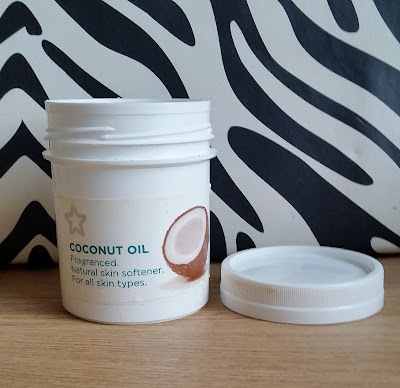 I have used the superdrug coconut oil as a mask over night and found it really easy to wash out. My hair felt really soft and manageable and wasn't left oily or greasy. It put all the goodness and life back into my hair that sometimes hair dyes and styling can take out. I also use the coconut oil on my skin especially if i have some dry areas on my face. I warm up the coconut oil in my fingers, then apply on well cleansed skin. I leave the oil to absorb without rubbing and then either wipe off excess with a hot cloth or a cotton face pad. My skin feels moisturised and glowing and doesn't break me out or aggravate my skin in any way. Over all this is a great multitasker and a must have for anyones beauty kit, you must own! This is currently on offer for £1.99 at superdrug.